I usually post links to articles I find interesting either on my Facebook page or lately in the Caught On The Web category here on my blog. I´d like to give an extra attention to this one, written by renown animal behaviorist and author Roger Abrantes. This is an excellent, thought evoking article which I highly recommend to everyone sharing their life with a dog, or, in fact, any kind of animal. We seek control and many of us crave perfection, and somewhere along the way we tend to forget what life is about, we forget what it feels to have fun and what the partnership with other living beings is (or could be) like. And sometimes we, the dog lovers, trainers, breeders, fanciers, mushers, handlers and enthusiasts just need a small reminder, some sort of recapitulation of why we chose to live and work with the animals. Here is a list of 16 things you should stop doing in order to make life with your dog happier and your relationship stronger. Roger writes: "Difficult? Not at all. You just need to want to do it and then simply do it. You can begin as soon as you finish reading this". I would like to take this opportunity to write a few words about the author and his work. I grew up constantly thirsting for books about dogs - I wanted to learn everything about their nutrition, health care and their behavior. The handful of books available to me then, in communistic and later post-communistic Czech Republic were all, but what I wanted to learn. Somehow, intuitively, I think, I was looking for something else than the military and police approach to training dogs, and I had problems to accept those methods. I also had trouble following the "standard" feeding guidelines for dogs and ended up doing what my gut feeling told me, when it came to feeding my own dogs. 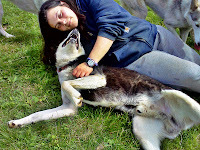 One day two of Roger Abrantes´s books on dog and wolf ethology became available in the Czech translation and I literally grew on these books during my early journey to mutual understanding with my first generation dog pack. The titles are The Evolution Of Canine Social Behavior and Dog Language and they still reside in my home library. As a matter of fact, it should be fun to list through them again! There is always a new message, always something new to learn every day, even if one read a certain book several times. Roger´s devotion to animal communication is so clear in all his writings, be it books or his articles. There is so much to learn from his smart, ethical and compassionate, yet practical point of view. You can visit his blog and read the numerous posts on many subjects here.